We’ve found an outstadning deal on NEW DRZ400 Lightspeed Carbon Fiber Frame Guards. The cost is $99.99 (incldes free shipping). Minus possible eBay auctions this is a great deal. See the DRZ400 Lightspeed Carbon Fiber Frame Guards here. A great deal on replacement graphics for the Suzuki DRZ400. The best deal we can find. These FX EVO Graphics fit all years of the DRZ400. Graphic Kit Includes: * Full Radiator Shrouds * Tank Graphics * Airbox Decals Price is $59.99 with FREE Shipping Click here to buy! Up for bid is a clean DRZ400sm engine. Looks like a great deal! Looks like a great deal with bidding starting at $699. Check it out here UPDATE: the eBay auction has ended check out our other DRZ400 articles for other deals. 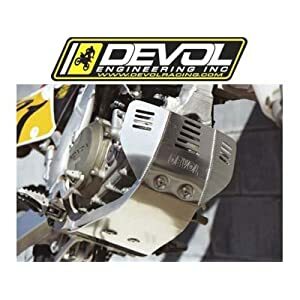 Great deal on a Devol Skid Plate!